Oley Dibba-Wadda is a strategic analyst and expert in international development policy and programming, particularly on education and gender equality in Africa. As Executive Director, she led multicultural and multidisciplinary Pan African development organisations including Femmes Africa Solidarité (FAS); working on women, peace and security in Africa and the Forum for African Women Educationalists (FAWE) working on girls’ education in Africa. Similarly, she worked as Global Programme and Policy Adviser for Oxfam GB in the UK and held senior management and advisory roles such as Project Manager, Country Director and Regional Co-ordinator with the Commonwealth Education Fund, Concern Universal and the European Development Fund. Oley raised and managed multi-million US$ budgets through multilateral and bilateral agencies, foundations, and governments and successfully cultivated and nurtured strategic partnerships. Oley sits on several Advisory Boards and is a Global Ambassador for 10X10 and Concern Universal – she was Chair of the Board of Trustees for Concern Universal. She presented as panellist, keynote and guest speakers on numerous high level international forums in Africa, Asia, Europe and the Americas, including the Commonwealth Heads of Government Summit (CHOGAM) in Perth, the World Bank Gender and Education Colloquium in Washington amongst others. Ms. Dibba-Wadda has a Master’s Degree in Gender Analysis in Development from the University of East Anglia in the United Kingdom and contributed to several studies and publications, including co-editor of Equals newsletter. 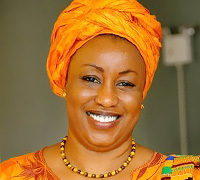 In 2012, she was awarded “Inspiring Woman of Excellence” in The Gambia and in 2013, “Women Leadership Award” in Mauritius.